In the classical education model, memorization is consider an essential during the grammar stage of learning. It provides the foundation for moving through the logic and rhetoric stages. Whether you follow the classical model or another method, memorization is a useful and powerful tool in learning. Having several children at different stages of learning, and wanting to incorporate more of the classical method into our homeschool, I began to search for resources that would aid me in managing and selecting the information I wanted my children to memorize. One resource that was mentioned time and time again for memorization was Living Memory by Andrew Campbell. I was intrigued by the high praises it was receiving and wanted to preview it for myself. Mr. Campbell was gracious enough to provide a copy for review. I was expecting a lovely collection of various facts and a poem or two but Mr. Campbell provides so much more! Living Memory contains enough memory material for your student(s) from kindergarten to twelfth grade. I would not even limit the resource to those ages; it would be beneficial to any adult seeking to study classically. Some of the most valuable content is in the beginning pages when Mr. Campbell shares about the importance of memorization and suggestions on how best to memorize. I love his discussion on our viewing memorization as foolish or impractical in this digital age. We are destroying our memory and losing such an amazing tool for learning. He shares reasons why memory work should return to education. Mr. Campbell reminds us that memorization is not a complicated process. It is a skill that must be used and developed; some will master it easier than others. He offers advice on how to use listening, speaking, reading and writing as methods to aid and re-reinforce memorization. One of the key points Mr. Campbell shares is that the goal is not to create a little parrot that can share information with no understanding. Choose memorization pieces that are relevant to your child and what they are learning. If you child is in 1st grade memorizing algebraic equations before basic math facts might not be the best idea. After these pages of memorization tips and techniques, there are over 400 pages of memorization pieces. Mr. Campbell provides selections in Latin, Arithematic & Mathematics, Grammar & Composition, Literature, Religion, Geography, World History, United States History & Civics, and Natural Science. The material ranges from the simplest of selections such as counting to ten in Latin, basic addition facts, the seven continents and the first 13 colonies to those of more difficult range; writings of Cicero in Latin, algebraic equations, Grammar catechism, and the countries and capitals of Oceania. I believe the most challenging aspect of this book is where do I want to begin! I highly recommend Living Memory. Whether you are a homeschooling mom, public school teacher or an involved parent, Living Memory is a valuable resource to have on hand. Mr. Campbell provides a wide range and depth of material that will meet the needs of any student. 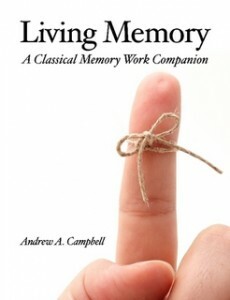 Living Memory is available at LuLu.com for $22.46. A preview is available here. Click on the word “preview” under the book. Thank you, Mr. Campbell for such an amazing resource for memorization. **Disclaimer: I was provided a complimentary copy of this product for review. No compensation was made. Opinions/thoughts expressed in this post are my own. This entry was posted in Book Reviews, Homeschool, Reviews and tagged Books, classical, curriculum, history, Homeschool, math, science by sweetie. Bookmark the permalink. Hey that sounds like just the book I have been looking for. Thanks. I am going to check it out. Thanks for the reminder that a little memory work is good for the soul. This is definately going on my wish list. I think it would be great for my crew. I know one little rebel in particular that would LOVE it! Memory work is one of those things that’s always been a goal, but one that never seems to make it on the priority list. I have two that memorize easily and do much on their own, but otherwise it’s not a focus of our homeschool. That might change once I get this book. Woo hoo! I hadn’t heard of this book. Great review. I think I could use some of those memory tips myself! This looks like a helpful tool. This year my children are actually following a plan for Scripture memorization that is working! Thanks for visiting my blog. I’m following your blog now. Going to check it out…sounds great! Thanks for your reviews…I trust your opinion! Thank you! We intend to use the classical model, and I find the options for memorization to be a bit overwhelming at times. This would be a wonderful resource!